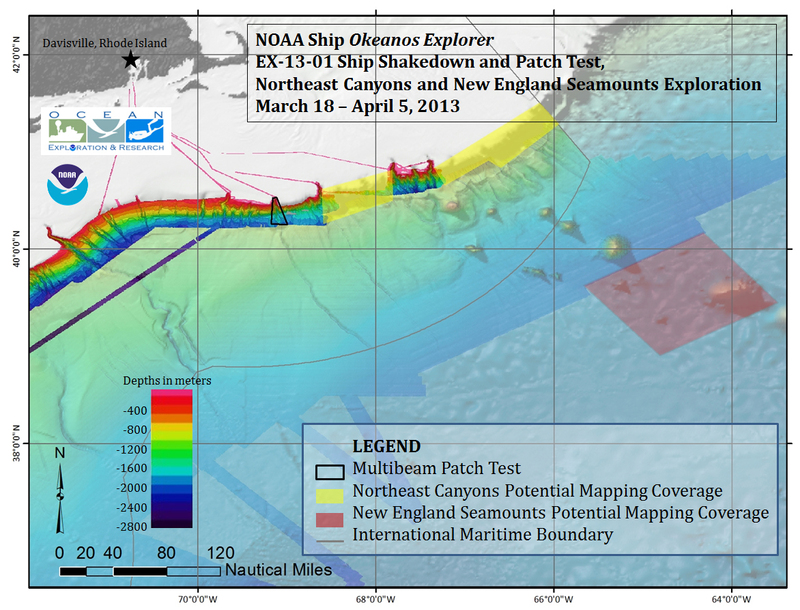 Map showing the boundary for the 2013 ship shakedown and patch test along with areas mapped during Northeast Canyons and New England seamount explorations. Image courtesy of the NOAA Office of Ocean Exploration and Research. Download image (jpg, 793 KB). 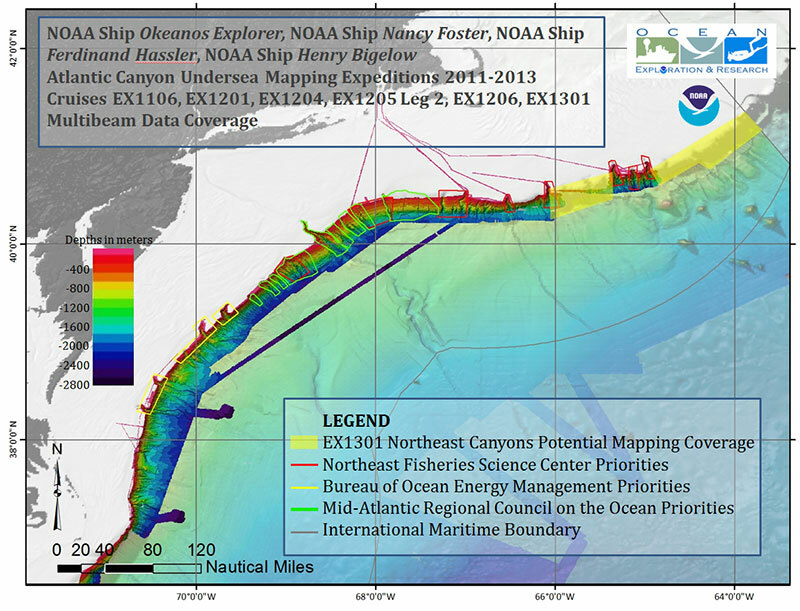 Between March 18, 2013, and April 5, 2013, NOAA Ship Okeanos Explorer will be conducting mapping operations within the Western North Atlantic Ocean, between Rhode Island and the U.S.-Canadian territorial boundary, as part of the annual ship shakedown (cruise name EX-13-01). Multibeam and singlebeam mapping operations will be conducted 24 hours a day throughout the cruise. Sub-bottom profile mapping will be conducted each day between the hours of 1000 and 1800 throughout the cruise. Research vessels conduct annual ship shakedown tests to perform at-sea testing of all scientific and shipboard systems following any significant period of inactivity and after major changes or upgrades to systems. Shakedown cruises are essential to a successful field season, and NOAA Ship Okeanos Explorer conducts one every year. This page describes the objectives of our cruise. Daily multibeam mapping progress can be seen on the Okeanos Atlas. As part of the at-sea testing, we conduct a system calibration to quantify the accuracy, precision, and alignment of the multibeam sonar. The calibration includes determination of residual biases in roll, pitch, heading, and navigation timing error. This procedure, commonly referred to as a “patch test,” is performed by acquiring data that will highlight only one bias parameter at a time. Generally two lines of data must be acquired to resolve each bias. Vessel speed, direction and/or seafloor slope will be specified for each line. Normal practice is to conduct an annual patch test prior to commencing a ship’s field season and again throughout the year if it is suspected that multibeam system integrity has degraded due changes in navigation sensor, motion sensor, or sonar system offsets; changes in the software controlling any of these equipment; and even changes in the cabling connecting these equipment to each other. Slight alterations in any of these parts of the system can have large detrimental effects on data quality, which is carefully monitored throughout the field season. We will duplicate last year’s patch test over Veatch Canyon south of Martha’s Vineyard, and in doing so will achieve a year-to-year data comparison in addition to proving system integrity. View a poster (pdf, 1.6 MB) created by 2010 NOAA Okeanos Explorer Program Interns Karma Kissinger and Shannon Hoy describing how to design a multibeam patch test. Poster courtesy of the NOAA Office of Ocean Exploration and Research. For the full NOAA Ship Okeanos Explorer Multibeam System Description and Data Usage Guide, click here (pdf, 635 kb). Ship shakedown cruises are also used by the ship to provided refresher training and safety stand-down for all crewmembers and to run all of the ship's equipment after sitting alongside a dock for several months during the offseason, typically in winter. Ships typically take this time to perform safety drills and routine maintenance on major equipment including main engines, stern and bow thrusters, dynamic positioning system, fast rescue boats, cranes, and even galley equipment like refrigerators and ovens. All of this equipment is essential to a successful field season and must be sea tested before heading to distant ports of call for several months. NOAA Ship Okeanos Explorer has conducted several exploration mapping missions over the continental shelf edge breaking canyons ranging from Cape Hatteras northward to New England as part of the Atlantic Canyons Undersea Mapping Expeditions project. 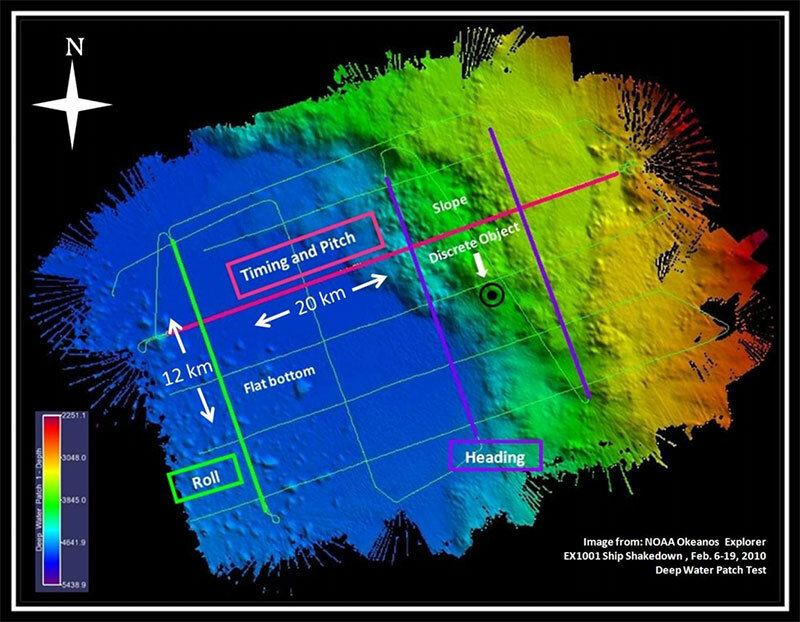 EX-13-01 will complete this major effort, and will result in the first complete high-resolution multibeam dataset stretching across the long chain of these unique geologic features. Map showing multibeam coverage of areas mapped during the 2011-2012 Atlantic Canyon Undersea Mapping Expeditions and the area that will be mapped during this expedition (shown in yellow). Image courtesy of the NOAA Office of Ocean Exploration and Research. Download larger version (jpg, 900 KB). Canyons are important habitat for deepwater coral and fish and are conduits for nutrient rich water from the ocean’s deep to reach the continental shelf. As North Atlantic offshore winter weather and cruise operational time allows, exploration mapping operations will also be conducted over several seamounts in the New England Seamounts chain. New bathymetry, subbottom, and water column data may reveal new exploration discoveries and targets. The 4000 – 5000 meter deep water surrounding the seamounts will also provide excellent deepwater testing for the ship’s sonars. Upon completion of the cruise, all data collected will be available in NOAA’s public data archives within 60-90 days of the end of the cruise, and can be accessed via the OER Digital Atlas. In order to facilitate ease of use of all mapping data by all future explorers and researchers, a Mapping Data Report is generated for each cruise. This constantly evolving report describes data collection and processing methods and details of exploration focus areas. Previous reports reside in the NOAA Central Library. A ship readiness report will be completed detailing all annual testing activities conducted by the survey department and mapping team during the cruise and describing the ship’s suite of scientific systems. Both of these reports will be available on the OER Digital Atlas after cruise completion.